Just like the nearby cross, this is a landmark station we first visited ten years ago, but didn't realize at the time that it was a station. 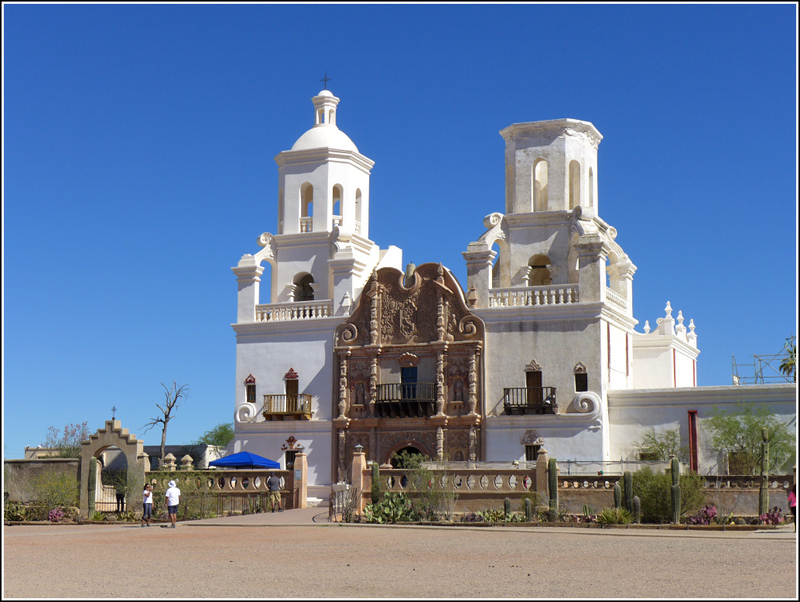 We stopped by the mission again today on our way from Tucson to Ajo and took some photos this time. We also thoroughly explored the mission grounds, including the cactus gardens, and bought some fantastic green and red chili burritos and fry bread with cinnamon sugar at the food stands on the grounds. If you're coming by on a Sunday, skip breakfast and/or lunch and just eat here! I found it interesting that the datasheet description doesn't specify what point was sighted on. I assume it was the top of the west tower, since it is white and stands out from a distance, rather than the small and dark cross atop the tower.